So, like, Merry Christmas and stuff. As of 5pm, I'm on vacation until after New Years. Have a good holiday (or long weekend, at the very least) and eat lots and lots of food! AngelMonster is a fictionalized retelling of Mary's life with Shelley and of her inspiration for Frankenstein. Be aware that while many of the details are accurate (Jane changing her name to Claire, Mary's life being saved by Shelley, and yes, the charred heart), Veronica Bennett played with the timeline somewhat. For instance, Frankenstein was actually written and published before Shelley's death in 1822, rather than after. In other words, kiddos, don't use this book as a basis for a report about Mary Shelley's life. Do, however, use it as a jumping-off point. I know I'll be looking for a decent biography of MWGS soon. While fans of the gushy romantic will like the first half of the book—with the running away and the passion—they might be unpleasantly surprised by second half of the book, which chronicles the more unhappy later years of the relationship. That aside, I'd definitely recommend it to teen fans of Frankenstein, to fans of the Gothic and to those who enjoy general historical fiction. Mary isn't exactly what we've come to expect from a strong heroine—many modern girls would've kicked Shelley to the curb pretty early on—but at the same time, many teens will identify with Mary's passion and with her feelings of drowning in love. Oh, and lastly. I'm not a really a big fan of the cover. It just looks kind of cheapy-cheesy-Photoshoppy. It reminds my coworker of Carrie (the movie). So. Has anyone noticed if it works—are kids picking this one up on their own? For those of you who, like me, are totally out of the loop*, the last Harry Potter title has been announced. If you want to find out the hard way, use Fuse's directions. *I spent yesterday holed up with no television reception, no internet and a pile of books. Okay, okay, yes -- you got me. And the PS2. I had no idea. I'm brilliant! Or not. I just guessed a lot. And Tango Makes Three pulled from library shelves in Charlotte-Mecklenburg Schools. 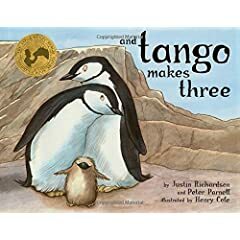 CHARLOTTE, N.C. | A picture book based on a true story about two male penguins that raise an adopted hatchling together has been ordered off bookshelves in one of the state's largest school districts, officials said. Don't cry, though. All is not lost. The Superintendent has taken responsibility for not following the district policy -- a miscommunication led to the book being formally banned from the school system without a written complaint or a committee review -- and has said that a committee will review the decision. Hopefully it'll be back on the library shelves soon. DrawerGeeks is a fun thing we do every other Friday, where professional artists (mostly from the animation, comic book, illustration and design fields) all draw their own version of a chosen fictional character. Children's book aficionados will want to check out the renditions of Raggedy Ann & Andy, Harry Potter, Alice in Wonderland, The Grinch, Hansel & Gretel, Tinkerbell, Pinocchio, The Wizard of Oz and Red Riding Hood. Whew. "If Chaucer was around today, he'd probably rap." Brinkman performs the "Pardoner's Tale," the "Miller's Tale" and the "Wife of Bath's Tale." His one-man show, with recorded music and a few props that include a couple of chairs, a bottle of water and a bandanna, is constructed much like the pilgrims' journey in "The Canterbury Tales." He acts as the narrator — a stowaway fan on a tour bus — and plays the part of three rappers on the bus engaged in a rap battle.